A heartbreaking tale of the secrets of war, this journey is part of the story of all wars. A family story of a murder, blood and betrayal that tore an Irish town apart and causes men to be silent still. ‘There was a tale about a British soldier being shot on the street outside my grandmother’s house. My father told this as a ghost story. The mood of the telling was wistful. The killing had been wrong. Why else would a ghost come back? My father said that if we watched carefully in the deep night we would see a green shadow moving around the bedroom overlooking the main street. I could never stay awake long enough to encounter the phantasm. 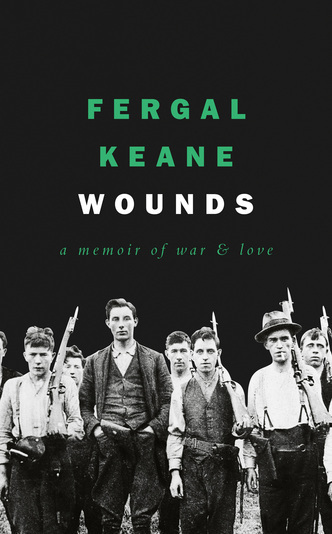 I was an adult before I learned the root of this story.’Trying to relate the kindly men and women of his childhood with the deeds made public long years after they died, Fergal Keane’s devastating history of a local murder asks, what is a terrorist? And how do people live with the act of killing? As those who pulled triggers, planted bombs and spied are long dead – as are their children – the bitterness of memory has faded in the towns where the violence and torture took place. Facing these people and their stories at last, ‘Wounds’ searches for a deeper sense of the personal history that made this colonial war, and how it initiated the beginning of the end of empire.